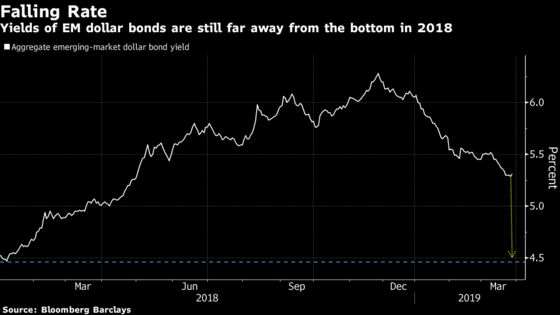 (Bloomberg) -- The red-hot emerging-market bond rally will likely keep on giving, even if it slows, global funds from Goldman Sachs Asset Management to T. Rowe Price say. Developing-market dollar bonds returned 5.4 percent in the first quarter, the best quarterly performance since 2012. The most vulnerable corners of the market could see turbulence as Turkey’s currency crunch rattles investors. But a dovish U.S. Federal Reserve and signs of recovery in China are likely to give emerging economies a boost. “There is still room for emerging-market debt to appreciate further,” said Thomas Poullaouec, head of multi-asset solutions for Asia-Pacific at T. Rowe Price. He’s overweight on such bonds with a preference for local-currency debt. Poullaouec sees annualized returns of 5.5 to 5.7 percent for the asset class over the next five years. Emerging markets could re-accelerate toward the end of the year due to China’s stimulus measures and stable commodity prices, but it’s also likely to be more volatile, said Poullaouec. Average yields on the U.S. currency notes have fallen about 74 basis points this year to 5.31 percent, but are still above the 2018 low of 4.47 percent, according to a Bloomberg Barclays index. “There is risk premium still within emerging-market bonds that could provide good returns in the medium term,” said Salman Niaz, senior emerging-market fixed income portfolio manager in Singapore at Goldman Sachs Asset Management, who sees value in Latin America, the Middle East and Indonesia. Beneficiaries of the Fed’s dovish policy include countries that rely on external funding to finance their current-account deficits, such as India, Indonesia and the Philippines, according to Shaun Roache, Asia-Pacific chief economist in Singapore at S&P Global Ratings. Fund managers looking for gains will have to pick their spots because while central banks’ dovish tone is supportive of credit markets, global growth “continues to disappoint,” said Angus Hui, head of Asian credit and emerging-market credit at Schroder Investment Management (Hong Kong) Ltd., who prefers investment-grade credit. Pacific Investment Management Co. has a “constructive” outlook for developing markets this year, but warns that the journey ahead will likely be punctuated by “bouts of volatility that separate the strong from the weak,” according to a March note. The rally has prompted some fund managers to reduce risk. After a good run year-to-date, UOB Asset Management Ltd. believes that emerging markets are “due for a pause” and has taken the opportunity in mid-March to “lower the beta” in its portfolios, said Patrick Wacker, fund manager for emerging-markets fixed income at the firm in Singapore. Beta is a measure of volatility or systemic risk of a security or a portfolio.